Museums preserve the culture and character of an area or era, keeping them safe for future generations to enjoy and learn from. Fortunately for those in the Keystone State, Pennsylvania offers museums that rival the greatest in the world, as well as those so unique they have no existing counterpart. Whether you chose to escape through the dreamy art of faraway lands, or zero in on local and national history, consider adding a museum stop to your itinerary from our top 10 list. As the largest museum on the continent to feature the work of a single artist, the Andy Warhol Museum is a world class experience and fitting tribute to one of the greatest American artists. An 88,000-square-foot converted industrial warehouse, the museum houses almost 15,000 Warhol works, ranging from paintings to photographs to sculpture to film. The Please Touch Museum is like a dream come to life for children and the more restless adults among us seeking a non-traditional museum experience. This hands-on museum offers programs and exhibits for art, the environment, health, music, movement, STEM, theater, and so much more. One of the more special opportunities is the annual “Kindergarten Mixer,” held every August. Children who are anxious to start school can meet a real teacher, ask questions, and watch a play about the joys of kindergarten. A worthy tribute to our beloved commonwealth, the State Museum in Harrisburg is dedicated to all things Pennsylvanian. Three-hundred and fifty notable natives are featured in a Hall of Icons, and a life-size 19th century “village square” depicts earlier life in the state. Also impressive are the hall of geology, an exhibit about Pennsylvania during the Civil War, and the much-celebrated Mammal Hall. Whether you’re a lifelong resident, a recent transplant, or just find yourself passing through, a trip to the State Museum is an absolute must. As the most comprehensive timekeeping assemblage in North America, the National Watch and Clock Museum boasts a stunning collection of horological items from around the globe. Arranged as a chronological history of timekeeping, the museum offers a new insight into global culture by contrasting vastly different styles of doing the exact same thing: Keeping and telling time. Exciting exhibits like the Watches of James Bond make the National Watch and Clock Museum a fascinating destination for all ages and interests. A visit to the Crayola Experience is like stepping into a vivid childhood fantasy you’d forgotten among the monotony of adulthood. Sixty-five thousand square-feet, containing 26 hands on attractions make this a waxy wonderland for both children and their supervisors. Make and name your own crayon, view the retired colors, and see the world’s largest crayon, made from scraps sent in by children across the country. Inject a little color into your daily drudgery with a visit to Easton’s Crayola Experience. Harrisburg’s National Civil War Museum aims to present the human experience of the Civil War, without bias to the Northern or Southern cause. Rather, the museum lays out the struggles and triumphs of both soldiers and civilians in an attempt to create a complete history of the war. Discover those dark days through letters, diaries, photographs, and the personal effects of those who fought, whether they won or lost. Built in 1853, the Eckley Miners Village was an anthracite coal mining patch town, set up to serve the needs of laborers and supervisors working in the shafts. Remaining on display are two worker houses, each for a different level of hierarchy, the boss’s home, two churches and a doctor’s office. Eckley Village was also the set for most of the movie “The Molly Maguires,” which told the story of Irish immigrant minors fighting religious and ethnic discrimination, often through violent means. Several set buildings from the film stand among the original dwellings, making for a multidimensional, educational experience well worth the visit. Fallingwater was built in 1935 as a summer residence for the family behind Kaufman's Department Store. Designed inside and out by Frank Lloyd Wright, it stands today as one of the most visited sites in the state, welcoming over 125,000 visitors annually. Explore the standard of modern American architecture, as well as the beautiful surrounding grounds with a visit to Mill Run. Be sure to book tickets in advance and wear your comfiest shoes. The American Treasure Tour is truly a singular experience. A collection of collections, the Treasure Tour is perhaps the greatest existing assemblage of Americana. Though the collections are diverse, the main groups are music machines, from nickelodeons to music boxes, and preserved early cars, both having played a key role in the development of broader American culture. Browse these collections, as well as model airplanes, vintage movie posters, patriotic art, and so much more in this inimitable immersion of all things America. 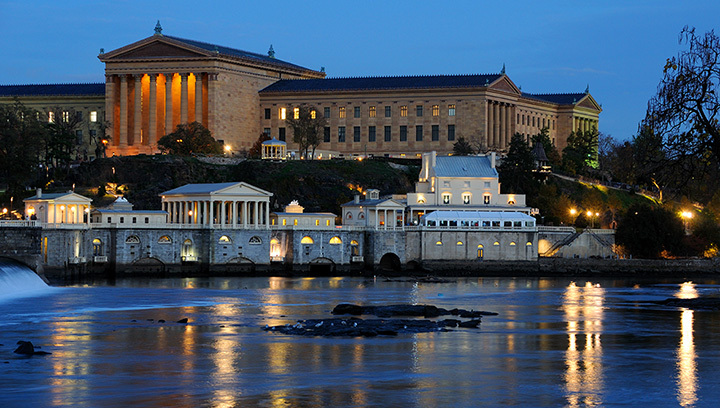 The Philadelphia Museum of Art is one of the finest museums in the world, and stands as one of the 100 most visited globally. Priceless works like Toulouse-Lautrec’s “At the Moulin Rouge,” Van Gogh’s “Vase with 12 Sunflowers,” and Monet’s “Japanese Bridge and Waterlilies” await your arrival, as well as other treasures by American artists such as Mary Cassatt, Marcel Duchamp, and Andrew Wyeth. The museum also holds the award for the second most famous movie location, falling behind just Grand Central Station, for being Rocky Balboa’s training ground. Visit the first Saturday of every month between 10 a.m. and 5 p.m., or any Wednesday evening from 5 to 8:45 p.m. and “pay as you wish” for access to the 250,000 pieces owned by the museum.